The paper, by Marguerite van den Berg at Amsterdam University’s Institute for Social Science Research, argues that one explicit aim of decision makers in Rotterdam is “the replacement of part of the current population by a new and better suited generation”, and that child-friendly initiatives are a key part of this process. The paper raises some crucial questions about the politics behind child- and family-friendly urban policies. After setting out some of its arguments, I will offer some thoughts of my own, as someone who is grappling with questions about child-friendliness and gentrification both professionally and personally. 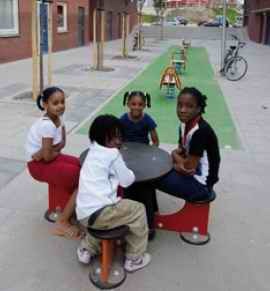 Child-friendly public space projects such as playgrounds and improving walking and cycling routes form part of the municipality’s approach to attracting families to neighbourhoods. However in the Netherlands – as in many other rich nations – children and young people are also looked upon as a source of urban problems. Van den Berg discusses one example: the ‘mosquito’ (a device which aims to disperse youths by emitting high-pitched sounds that only young people can hear and that they find highly unpleasant). I can report from direct experience that these devices are almost medievally brutal in the way they work. A few years ago I was taking a group of teenage boys studying for a construction qualification on a morning walking tour of the EC1 area of London. We headed to a McDonalds for some refreshment – then had to leave quickly, because the mosquito’s sound was too much for some of them to stand (though I could hear nothing – and neither could some of the young people, which brought home perfectly the indiscriminate effect of the gadget). She discusses Rotterdam’s policy of promoting the combining of two smaller apartments into one larger one, to create a larger living space that is more attractive to families. It may lead to more (wealthier) families moving into a neighbourhood. But if that neighbourhood is overcrowded, this will only happen if some existing (poorer) residents are in effect pushed out. Given my distance from the city of Rotterdam and its work, it would be foolish for me to pass final judgement here. But I did find the paper of value in revealing some neglected issues about child-friendly city programmes. The first is the significance of the very fact that Rotterdam – a big, economically significant city with real problems – has made child-friendliness a key strategic goal. What is more, the city appears to be pursuing the goal with focus and purpose, as this powerpoint file shows [pdf file]. On the face of it, the programme is a fine example of the arguments of Enrique Peñalosa, former mayor of Bogotá in Colombia, who has said “Children are a kind of indicator species. If we can build a successful city for children, we will have a successful city for all people” (a maxim I embraced in my Sowing the Seeds report). As van den Berg herself points out in her conclusion, such a move could be pursued in progressive ways (as Peñalosa did in Bogotá). Gentrification is undeniably a double-edged sword for poor neighbourhoods. Take for instance Walthamstow, the London suburb that I have made my home for over 15 years. It has threatened to become gentrified throughout that period (thanks in part to young families moving here from areas of the city where decades of gentrification have driven house prices beyond their reach). Indeed the Guardian newspaper recently ran a breathless sales pitch for the place. Even though it is still endearingly scruffy, I have seen the tensions generated by the mere prospect of an influx of wealth. Some existing residents and small businesses are becoming resentful of the influence of newcomers who appear to be more successful in getting the attention of decision makers. Yet any neighbourhood that cannot attract people to live and work is destined to struggle. I recall over ten years ago, speaking to a regeneration manager involved in a pilot home zone project in Northmoor, a run-down part of Manchester. His job of getting residents to agree changes to the street layout was made much easier by the fact that car ownership was so low. Yet he was clear that if the improvements led to more people with cars moving in, that would be a sign of success, even if it was in tension with the new street design’s goal of being a more sociable and playful place. The strongest criticism of the city of Rotterdam is that it appears to be deliberately and actively marginalising poor families, in the pursuit of an image and ambience that will appeal to more affluent and desirable residents. However, it may be that these policies are not as joined-up as the paper suggests. I know from my own work with municipalities that policies do not always fit together coherently. So the Parks or Planning Department, say, may have fine child-friendly policies and practices, but these can be undermined by the work of colleagues in crime prevention or transportation. Cities are complex places, as Jane Jacobs recognised – (and her writings on what she called ‘unslumming’ poor areas are well worth revisiting). Wealthier incomers do not necessarily lead poorer families to be pushed out. Public agencies do not necessarily share the same goals or values. It seems to me that what Rotterdam shows is the importance of a clear, coherent guiding vision that everyone in a city (or at least, everyone who cares about that city) can sign up to, regardless of income or background. My own vision of child-friendly neighbourhoods is that they are welcoming and inclusive places, and also places where people work systematically and collectively to tackle poverty and disadvantage, rather than simply blaming poor people for the situation they are in. 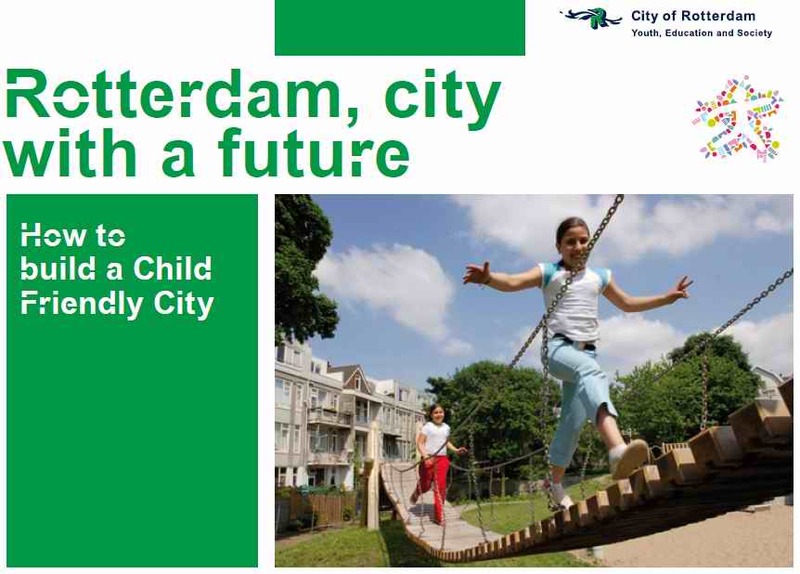 with a future: How to build a child-friendly city [pdf link] published by City of Rotterdam. Thanks to Dr Geoff Woolcock of Wesley Mission Brisbane for alerting me to Marguerite van den Berg’s paper. This entry was posted in Public policy, Public space, Urban planning, Urbanism and tagged child-friendly cities, gentrification, Jane Jacobs, Netherlands, public policy, Rotterdam, urbanism. Bookmark the permalink. Hi Nigel – thanks for stopping by. I just checked your blog and couldn’t resist leaving a comment on your most recent post on poisonous plants! Glad you found me, hope to see you again! This is a good, readable article, interesting to read your thoughts. I am concerned about the poor being ‘driven out’ of cities. Fresh air and good open spaces, with trees, are essential for all, not just the wealthy. Hi Suzanne – thanks for the generous feedback, and I agree with you. Hi Steve, thanks for the feedback and it’s fine to reblog. We saw this very interesting post on ‘child friendly’ cities on the ‘Re-thinking Childhood’ blog yesterday and it’s author, Tim Gill, has kindly given us permission to re-blog it. The post looks at how the theory of child-friendly cities, which is linked to children’s rights, has the potential to go astray when picked up by policy makers and practitioners with perhaps unitended consequences for poorer families. Readers may be interested as there is a strong case to be made for attempting to tackle poverty using a children’s rights perspective. I found it a disconcerting read. It is an interesting philosophical conundrum. It has been suggested that all planning will have a similar implicit driver. Altho it would appear that there may be a slightly less than altruistic agenda at work in Rotterdam and elsewhere for that matter, I think the explicit headline principles of the norm remain commendable; that is, to provide an urban environment, both geographical and attitudinal, that is play friendly for all the children that occupy that environment; to shift the policy balance from disproportionately accommodating the needs of adults, particularly adults as drivers, to one where children’s play needs are given a higher priority within public policy. It may be that in Wales we will want to hold in mind the other intended and unintended (overt / covert) consequences of the process. 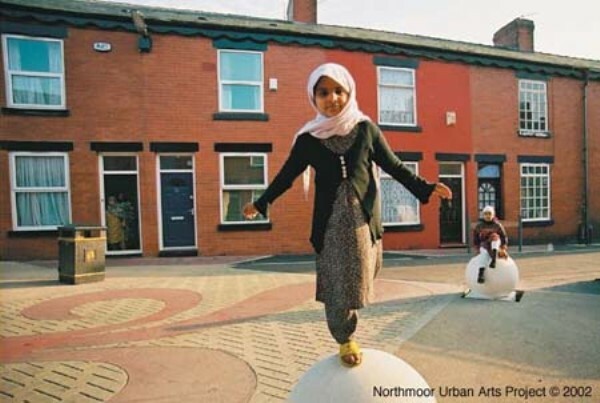 Certainly from our perspective, working with the Welsh Government we, and they, had seen the ‘norm’ as contributing to a paradigm shift in public thinking as to how we accommodate children and their play needs, particularly in cities. As local authorities in Wales have undertaken the first play sufficiency assessments (including the development of action plans to address shortcomings that they identify) required of them by the new legal duty, they have been encouraged to consider the principle of the ‘norm’ on an authority wide basis . . with a long term view that we may ultimately end up with many local authorities designating all public open space etc as children’s play space . . . and Wales will become one big play area (we can day dream). Mike, Adrian – belated thanks for these comments. I was pleased to read your thoughtful exploration of the relationship between child-friendliness, ethics and political philosophy, Adrian. It reinforced a view I came away with after last night’s stimulating NCB debate on childhood: that there is a pressing moral case for play advocates to take more seriously – and address more explicitly – the problem of child poverty. Thanks Will – I’ll check out your piece.